I have over 120 excel files to protect with the same password. from a customer file and because the context of each file is private, i need to secure these files with a password. Every time a user try to open a file, it must prompt to input a known password. when i generate the excel file? I didn't test it but this code and your explanation don't seems to match. NOTE: the code that I am suggesting is untested. I don't have access to WinDev, i'm at home (today at least i leave the office at a decent hour). I will try your solution tomorrow morning.. Thanks again for your support.. If you are getting frustrated because of losing the password of Excel file so in this case just make use of the foremost eSoftTools Excel File Password Recovery Software that scrutinize all Excel file and take out the original password. You will get password by taking help of two unique methods like- dictionary attacks and brute force attacks. Both methods are easy to operate and capable to recover password and also takes small period of time for recovery password from Excel, word and Access file. SysInspire Excel Password Unlocker Software is enhanced & successive application which efficiently works to find out the lost and forgotten Excel file password and Unlock Excel file program. By taking help of this Excel Password Remover Software users can remove protection from Excel file, Word documents and access file password. Excel Unlocker Excel Unlocker Software offers very easy to handle unique method such as- dictionary attacks, brute force attacks and password known attacks for recovery password of Excel file related to alphabetic, numerical, symbolic password from excel file. Excel Password Recovery Software supports all excel file versions included- 2016 and 2013, 2010 Password, 2007, 2003, 2002(XP), 2000 and Excel 97. Excel File Password Recovery Software which is suitable program to recover forgotten MS Excel Password and unlock protection of Excel file password. Using of PDS Excel Password Recovery Software all users can recover all kind of password alphabetic, numerical, special-characters and symbolic of Excel worksheet password and also preview of all recovery process at free of cost. This Software works on whole MS Excel file versions including: 2016, 2013, 2010, 2007, 2003, 2002(XP), 2000 and Excel 97 & Windows Versions up to win 10 (32 & 64 bit). 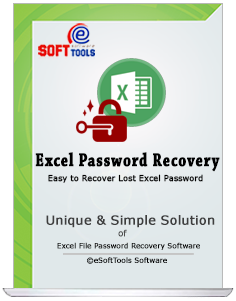 Instantly recover lost excel (.xlsx, .xlsm, .xls, .xlsb, .xla, .xlam, .xltm) file password with the use of eSoftTools Excel Password Recovery Software, this is one of the best solution ever who recover, remove, & unlock password form excel workbook. This application easily breaks protection with the help of the Brute Force attack, Mask attack, & Dictionary attack without any damage. It has provided a FREE DEMO VERSION and supports all Excel version 97 up to 2019 and Windows 10. Also, recover Access file password & Word file password using this tool.